A fully refurbished building for sale in a popular village with amenities within walking distance. Perfect for investment! This tastefully refurbished building has been decorated to a high standard but has been kept simple meaning that it fits nearly all tastes. It’s split over two floors and the bottom floor has a commercial license meaning that it could be made into a shop or a business of some sort. On the upper floor is the sleeping quarters. Upon entering the property we have a small hall and then the open space living and dining room. Towards the end of the room there is a large bathroom which is brand new and modern. Upstairs, there are five bedrooms but it would be better if two of them were made into one making a master suite. When we come up the stairs, we can enter a corridor to where the bedrooms are or turn right into the kitchen. The kitchen’s appliances are all electric and there is a hot water cylinder meaning that there is no gas in the house. There is a good size bathroom at the end of the corridor which has a shower cabinet. There is a small patio area which can be accessed off of the kitchen which gives separate access to the street. So if you did decide to split the house in two, there are already separate entrances. 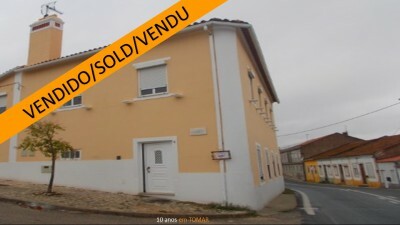 The property is situated in the village of Santa Cita which has a restaurant, cafés, supermarket, ATM, pharmacy, etc. The larger town of Tomar, which is home to the UNESCO listed Convento do Cristo, is around 10 minutes’ drive from the property. Tomar is a bustling market town with a variety of supermarkets, shops, cafes, restaurants, bars, banks, health centres, hospitals, schools, bus and train station and university. The property is also only a short drive from Castelo do Bode Lake, which is popular for all kinds of water sport activities.